I was already surprised that TWR could use a diesel mechanic with power generation experience, but an even greater surprise was that the power generating units TWR used were the same ones I was already familiar with. This was confirmation to me that God was working his plan. Why was this so significant? I had gone to Nanisivik in the Canadian High Arctic to make money. My job was to run the power generating station. But God had sent me for a completely different reason. I now had in-depth knowledge of the exact generating sets I’d be working on in Bonaire. I was already equipped to immediately give input into the running of the station. This was a gift from God. As a result, adapting to my day-to-day job responsibilities was easy. Adapting to the culture of the island wasn’t. Bonaire was administrated by the Dutch government, but the culture wasn’t Dutch; it was Antillean. Education and government were done in Dutch, but the island people spoke Papiamentu and had a very different culture. At the beginning, there were many times we found ourselves wondering what we were doing there. Was this a good idea? Even grocery shopping was a culture shock. We’d grown used to how to buy food in the Arctic, which is different by most standards! We either ordered our food from Montreal by phone or shipped it in once a year by boat. To arrive on Bonaire and realize that getting groceries would again be a challenge, but in a much different way, was a surprise. Initially, Sandy spent many hours grocery shopping, not because of too much choice but because of lack of choice. They didn’t have our brands; it was too expensive, and there were bugs in the food. Eventually it became normal. Shopping trips got shorter, and our daily life settled into a routine. Bonaire was a fishbowl society. There were lots of missionaries, and we did most everything together, which was good in many ways. You had instant friends, support when you needed it, and you didn’t have to learn the local language, which for me was huge. God has given me many gifts but the ability to learn another language wasn’t one of them! The kids and Sandy were far more successful. Life was almost perfect! Living in a hot climate was wonderful once we got used to it. I was home every night and on weekends. We had lots of friends, and our kids seemed to thrive. They adjusted well to the school system (read how God used the education system on Bonaire to turn Erin’s learning disability around). They learned how to scuba dive, windsurf, sail. We went to a TWR church. Sandy volunteered a portion of her time to the mission. If you had to be a missionary, Bonaire was a great place to be one! Bonaire had become our home, and all of a sudden we were more comfortable there than we were in Canada. My years on Bonaire were great years. I loved being a mechanic. I didn’t care how dirty or hot the work was; it was simply a joy to be able to turn a switch and hear the turbocharger wind up and those huge engines come to life. Yet there were challenges at work. One in particular stands out, from 1989. 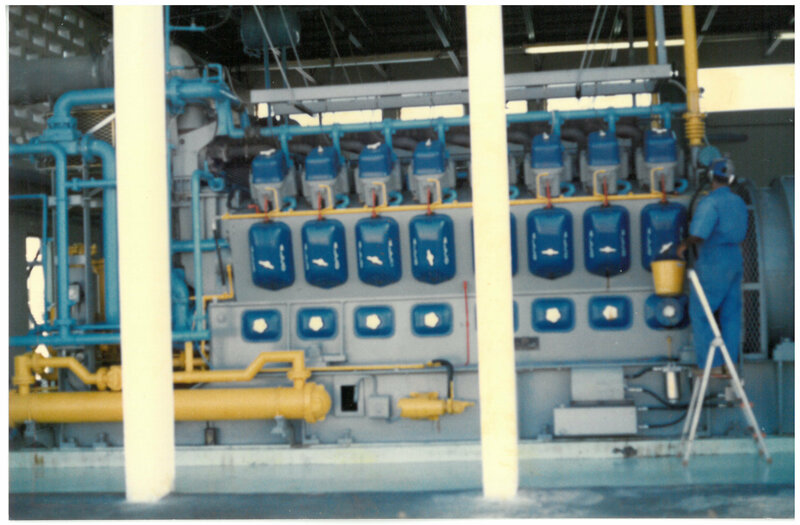 TWR had operated the engines and generators since 1964, and they needed to be replaced. We had to figure out what new technology was available and then select the best fit. And they were not cheap. For the first time in my experience, I was looking at a project over $100,000. My thought was, this is impossible; how will we ever raise this kind of money? We decided it made sense to buy them over two consecutive years. Imagine how surprised I was when someone told us they would pay for one; we were to go raise funds for the second! In no time, the funding was in place. I saw God doing the impossible. They say nothing remains the same forever, and this turned out to be true of our time on Bonaire. When TWR started broadcasting on Bonaire, medium wave (AM in North America) was the primary broadcast medium. We had licenses for super-powered medium wave transmitters reaching thousands of kilometres. People tuned across the dial and heard the gospel. For a long time, this worked well for us. FM was small in those days so our broadcasts were filling a need that was being met no other way. By 1993 that started to change. Short wave stations were being shut down; FM had replaced MW in some cases so discussions began on what the station on Bonaire should look like in the future. This turned my world upside down. I loved what I was doing; my earthly desire was to leave things the same. I could see if leadership changed anything, my future on Bonaire would change. They wouldn’t need the huge generators…they wouldn’t need me. After much discussion and prayer, it was decided that the short wave broadcasts would come to an end. The immediate problem was what to do with the existing generators, the ones we affectionately called “Ma and Pa.” They were no longer needed. These units were not something you packed into a box and set up somewhere else! But their value to others was limited. The local utility company was one option. We began discussions, but they weren’t interested in buying them. However, they were interested in us buying power from them, which would allow us to get rid of our units completely. It was a viable option, except for the price they wanted us to pay for power! We kept talking; I kept praying for a solution, but I couldn’t see one. One night I woke up suddenly, and I knew God had answered my prayers! He told me to go to them, offer them our units and offer to help them tie our plant into their grid. In return we wanted a reduced power rate for 10 years. The next morning I was so excited! I shared my concept with the station director, and he told me to set up a meeting. The utility company loved the idea! It helped them with capacity; it worked for us, and they agreed that I would work for them as a consultant to ensure that the whole thing happened. Our international leadership also liked the idea, and we made it happen. For the next year that was my focus. At the end, I would no longer have a position on Bonaire. There would no longer be a need for my expertise. I didn’t really care. I was having the time of my life now. Little did I know that my life would not only change but take a turn I never expected. I didn’t envision it, but God had a plan, and he was working it out in his time and in his way. Stayed tuned for the next chapter in this exciting story.